Enlarge / The 8Bitdo M30, posed next to a pair of Toejam and Earl figurines that shipped to select Kickstarter backers. Roughly a week ago, two bulletins landed in my inbox from companies eager to capitalize on Sega Genesis nostalgia. I nearly shrugged them off, since neither actually came from Sega. But their coincidental, nearly simultaneous appearance triggered a wave of ’90s nostalgia that made me bite. The result has been a solid few days back in my early-’90s childhood, as if I were firmly planted in front of a massive CRT TV with some of my favorite games of the era. (If you’re wondering: this ’80s-kid author absolutely had a lengthy “Genesis does what Nintendon’t” phase.) My recent feeling may have emerged, in part, because Sega’s current handlers left Genesis fans out to dry during the tiny-console fad. The less said about the AtGames Genesis Flashback—an atrocious cash-in that followed the NES Classic—the better. 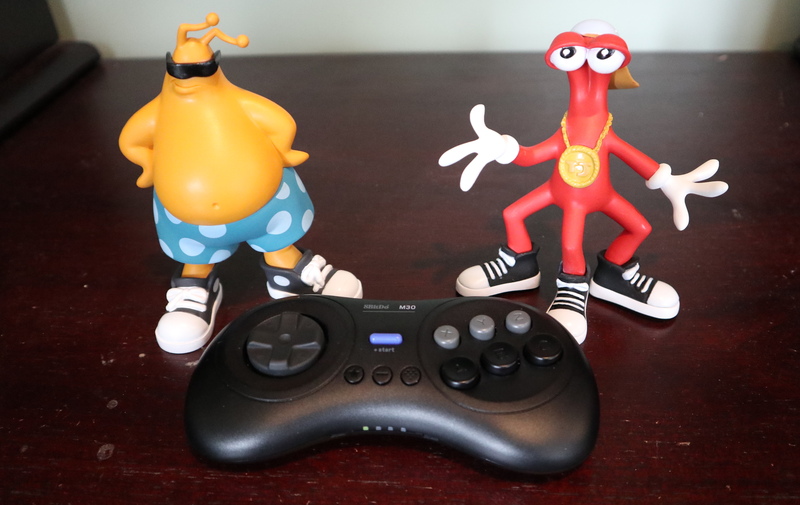 But this week’s one-two punch of releases was just what I needed to wash a foul taste of wasted nostalgia out of my mouth: the 8Bitdo M30 gamepad and the new game Toejam & Earl: Back in the Groove. Both feel a whole lot like 1992: hardly revolutionary in modern terms, yet somehow packed with that singular, early-’90s feeling of new, refreshing ideas around every corner. So, please humor this Sega fanboy with a twin-review trip down Genesis lane. In the new game’s opening cinematic, ToeJam and Earl go on a joyride above Earth’s orbit. They crank up some tunes. After being sucked into a black hole, ToeJam, Earl, and their friends must scour their new reality to find their ship’s parts and get back to Planet Funkotron. Sound familiar? For reasons that will become clear in a second, any conversation about the new entry in the ToeJam & Earl franchise is incomplete without a history primer. ToeJam & Earl is a funny footnote in Sega Genesis history, precisely because the original 1991 game—with its rap-loving, smack-talking aliens—very well could have been the attitude-filled mascot game to directly face off against Nintendo. Of course, someone else at Sega famously took that job and, er, ran with it. In spite of its hip-hop styling and cartoony characters, TJ&E was never going to blow the gaming world up as effectively as Sonic‘s massive sprites, diverse worlds, and high-speed scrolling. Instead, the series rounded out Genesis’s early library by combining the PC-gaming concept of rogue-like adventuring into a kid-friendly quest. Two major aspects of every playthrough were always randomized: the level designs and the kinds of items that your heroes could pick up and use to survive their slow, funky walks past Earth’s harmful denizens. And that’s… pretty much all you did. Neither ToeJam nor Earl blasted ray guns or stomped baddies’ heads. Adventuring revolved around uncovering each level’s randomly generated terrain to find the 10 rocket ship parts you needed to beat the game. The catch, of course, was its co-op support, which meant two friends could wander together and even go separate directions to explore different parts of each world, at which point the screen would auto-magically split in half. The result was something simple enough to hand to anybody with a passing knowledge of console games: nowhere near as complicated as a flight simulator, but also not as brain-numbingly simple as the board game Candyland. The original 1991 game’s focused formula was never repeated in either of its sequels. TJ&E2 opted for a more traditional, side-scrolling platformer, while the OG Xbox exclusive TJ&E3 was a confused, collect-a-thon mess. In both cases, interviews have hinted that the games suffered from meddling producers or other outside forces that didn’t care for the OG Genesis design. A whopping four years later, here we are, with ToeJam & Earl: Back in the Groove. In very good news, all of that time in the oven did nothing to stymie or complicate the basic, satisfying thrust of the original game. Instead, Back in the Groove is boosted by even more roguelike weirdness and multiplayer support. Smooth split-screen options are appreciated. If a bad guy’s getting close, find a way to hide. Diving into water is one option, though that’ll run your oxygen meter out. Or just hide in some sunflowers. Chilling with a friendly character (as indicated by a white sparkle effect) also works in a pinch. Here, Gandhi asks us to embrace love. A sampling of the unfriendly earthlings you’ll encounter. “Internet Troll” is a personal favorite. Use this button-tapping mini-game to earn experience points and cash. A better look at what the stats mean (but you don’t pick which ones go up every level). In the character select screen, you get to actually see exactly how the heroes’ stats differ. Hi there, old-school ToeJam. New-school Earl is much slower. You’ll have to use special items to reach the gift-filled “backer island,” which randomly appears and (assumedly) includes a real Kickstarter backer’s likeness. Glide across a frozen lake in any ice zone. Or use a flashlight in a dark zone. If you get the right random item, you can turn all lights on in dark levels, but I dig how this 3D lighting effect looks in action. You’ll need to talk to “helpful” Earthlings to figure out what your randomly granted items are. Or just open them and see how good, or bad, the results are. Some of the items in the new game. Wanna play online with randos? A quick-chat interface will help you keep headsets at bay. As shown above, Back in the Groove looks remarkably like the original game, at least in terms of basic framing. A camera hovers above the world in 3/4 perspective, and players walk around randomly generated levels to find their broken rocket ship’s various parts. Collect 10 of them to win, and pick up random items along the way to help as various harmful Earthlings start getting up in your extraterrestrial grill. The original game shone as a two-player adventure, and that quality has been boosted by the modern age. First of all, if you have four controllers to pass around, then the game’s auto-magical screen-splitting feature will let you and three pals wander around random worlds on the same couch. It’s pretty slick in action. You can elect to have the screen split based on who walks in which direction, or you can focus that screen-splitting so that, say, player one always breaks off to the top-left corner. Either way, this automatic process very rarely gets in the way of clarifying where each player is. What’s more, this split-screen fun carries over to an online mode, which supports random matchmaking in a pinch. However, we were unable to comprehensively test this mode during Back in the Groove‘s preview period on Windows PC, so there’s no telling whether your online funk-venturing will run smoothly via the game’s peer-to-peer matchmaking system. Either way, you can choose to toggle split-screen mode on or off while playing online, which is a nice touch. If you’ve played the original TJ&E recently, then much of Back in the Groove‘s content will look familiar. Pretty much every power-up from the original game is back, including rocket skates, flight-enabling wings, and throwable, weaponized tomatoes. The original armies of helpful and harmful Earthlings are back, as well, including a mischievous Cupid whose arrows temporarily rotate your d-pad 45 or 90 degrees and a hula girl who temporarily makes your character stop and dance (which can set you up for getting run into by another harmful human). In good news, the suite of items and baddies alike ramps up to accommodate increased difficulties, including a few more weaponized item options (some of which must be unlocked by beating the game multiple times). The biggest knock I’d offer comes from the relatively cheap aesthetics. Though I do like the art direction in terms of the hand-drawn characters, Back in the Groove‘s cutout-character animation style doesn’t flatter these drawings. The wiggly characters in action look less like Paper Mario and more like a cheap Flash game. There’s also the matter of lacking voice acting. So much of the dialogue is relegated to text, which certainly injects fun into the proceedings, but an optional “tutorial” run of the game’s first few levels comes complete with voiced instructions. Hearing those again as I double-checked aspects of the game reminded me of how quiet the game feels. But there’s no shortage of silly text quips, if that’s appropriately retro to you, and the hand-drawn characters do come with a delightful, ’90s-Nicktoon wackiness, which feels totally appropriate. I’d say that’s enough to fulfill the sales pitch: a low-stakes co-op adventure game that you can laugh through with some friends. You won’t survive insane battles or sleuth out brain-bending puzzles; instead, you’ll half-run, half-sneak through a world of goofy cartoon faces and outlandish cartoon butts, which you must navigate as an alien by equipping spring-loaded shoes and high-fiving your co-op partners to keep their health bar up to snuff in a pinch. The series’ original formula scales well for randomized levels and item acquisition. Back in the Groove certainly lacks the depth of the single-player roguelike adventure game The Binding of Isaac, and its fun expires more quickly when played solo. But the opportunity to go back to its colorful, accessible worlds as a duo, trio, and quartet does plenty to make me want to dive back for a few more full runs (which I’d approximate at roughly two hours a pop, at least on “normal” difficulty).